24VAC to 12VDC converter, 1.67Amps, 20 Watts with high efficiency and removable terminal block from PowerStream also 36VDC to 12VDC DC/DC converter. 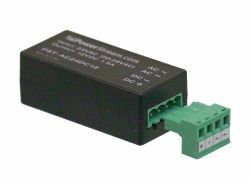 Tiny switchmode 24VAC/12VDC power supply offers much higher efficiency and lower ripple than the cheaper linear versions. The biggest application of these is to power 12 volt video cameras to replace 24VAC cameras, fiber optics transmitters, media converters, REX PIR's (request to exit passive infrared), proximity readers and other accessories. 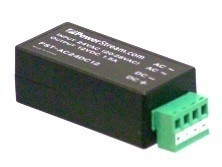 Also works as a 36VDC to 12VDC converter. Since the input voltage can sag to as low as 20VAC these can be used at the load end of a long wire 24VAC run to give a regulated 12VDC. Note that there many products available that look like this, but have poorer specifications.